For many of us average homeowners, interior design is not a skill that comes naturally. Sure, we can watch all the HGTV we want and dream about performing the latest design techniques with flawless precision. But for many of us, those dreams can become nightmares. Don’t worry, I'm going to share some color matching tips that’ll take that Michael Meyers-like fear right out of your mind. If you're not familiar with Michael Meyers, he's a fictional character from the Halloween series of slasher films. Continuing on; ever notice how he always found just the right shade of coveralls to amp up the terror of his stark white mask? Boy, that Michael sure knew a thing or two about complimentary colors. Well, by the end of this blog, you might just become a killer coordinator yourself! Many times, the hardest interior design choice to make is color. Throw in the stress of appropriately color matching and you've got all the makings of a fearful project that never gets started. 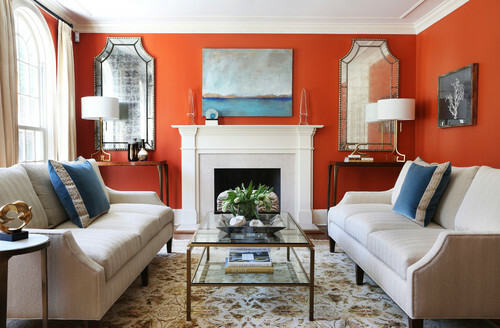 Deciding what color paint to use or furniture to purchase is a big investment and brings around the idea of permanence. What if we make the wrong choice and now its rolled all over the walls? Eeek! With companies like Behr and Benjamin Moore offering thousands of color choices in paint alone, it’s easy to become overwhelmed and send redecorating projects zooming to the moon before they even launch. Luckily, a simple brush up on color basics takes away a lot of the apprehension. A quick color wheel lesson will bring all sorts of helpful insight! For instance, if you want to bring a sense of harmony into your home, picking colors next to each other will do the trick. On the other hand, if excitement is your game, choose opposites on the color wheel and bring a clashing exhilaration into your home! I’m sure studying color theory isn’t your ideal way to spend the beginning of 2018, but understanding how colors impact each other will add confidence to your interior design choices. Still feeling iffy, huh? Maybe all the studying in the world isn’t going to slay your decision making dread. After all, picking out a new color scheme for your home isn’t as simple as picking out a new outfit – or is it? Yep, you guessed it! Using your personal fashion sense is a great place to start when considering colors for your home. In fact, professional interior designer, Kendall Wilkinson, recommends getting a clue from your closet to help determine what colors you naturally feel good in. If you’re worried about adding too many colors, but don’t want your room to become drab, keep your base and secondary colors neutral and add some small, but interesting accents around your room. Throwing in some quirky toss pillows, a captivatingly colorful area rug or a ravishingly radiant carpet runner can add just the right amount of pizzazz to your new space. You can also work your project from the other direction by taking your favorite accent piece, like a patterned couch or area rug, and pulling your colors from there. Use the neutrals in the pattern for your base colors then add accents in your favorite color(s) from the pattern. Your favorite painting can also work wonders for color inspiration. Artwork can be very expensive and hold sentimental value, so it tends to be something you're comfortable holding on to for several years. You might have a piece of art that set you back more than a pretty penny. Or maybe one that has been handed down for generations or was handcrafted by a talented loved-one. So why ditch it to redecorate? Don't! Instead of banishing your painting to another room, let its colors flourish at the center of your interior design choices! If structure calms your fears you can always use the 60-30-10 rule. The premise here is that 60% of the room is done in your base color, 30% is in your secondary color, and the remaining 10% is finished with an accent color. Sticking to this guideline guarantees an appealing balance of your space. But for those of you who believe rules were meant to be broken, go ahead and flip this one on its back! Playing with percentages is a daring way to create a more than unique room. Okay, we’ve come to the scary conclusion that all of the rules, theories, and guidelines of decorating can be modified or even broken. Coordinating, clashing; it’s all acceptable. But arming yourself with a bit of color theory will show you how to do all of it well. It might even take away those looming fears, turn your nightmares into dreams and get you into your own pair of killer coveralls... for painting, of course! Now it's up to you to decide what styles you want to include in your home. Go have fun with it!